From the Hancock County Courthouse go west on Hwy 22 for 0.3 mile to Dixie Rd. Turn right and go 0.6 mile and cross the railroad track to fork in road. Take left fork on St. Mark Church Road and go 1.0 mile to its dead end at old Pumping Station Rd. / Old Milledgeville Hwy. Turn left and follow Pumping Station Rd / Lake Shore Dr. for 3.5 miles to Hunt's Chapel Road on the right. Turn right and go 0.1 mile to field/woods road on right. Follow the field/woods road for approx. 300 yards (0.2 mile) to the cemetery, which is on the right of the field/woods road. It is not known whether this large cemetery is associated with Hunt's Chapel Church or not. The cemetery has clearly defined rows of graves (depressions), with perhaps 30 rows of about 10 graves each. Some graves are marked with fieldstones. There are no marked graves in the cemetery. 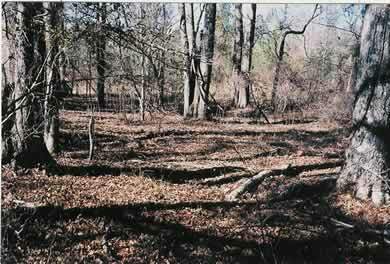 Fieldstones and depressions are visible and reveal about 300 graves arranged in about 30 rows of 10 graves each.